Get ready for the 23rd Screen Actors Guild (SAG) Awards on Jan. 29 with a printable ballot. 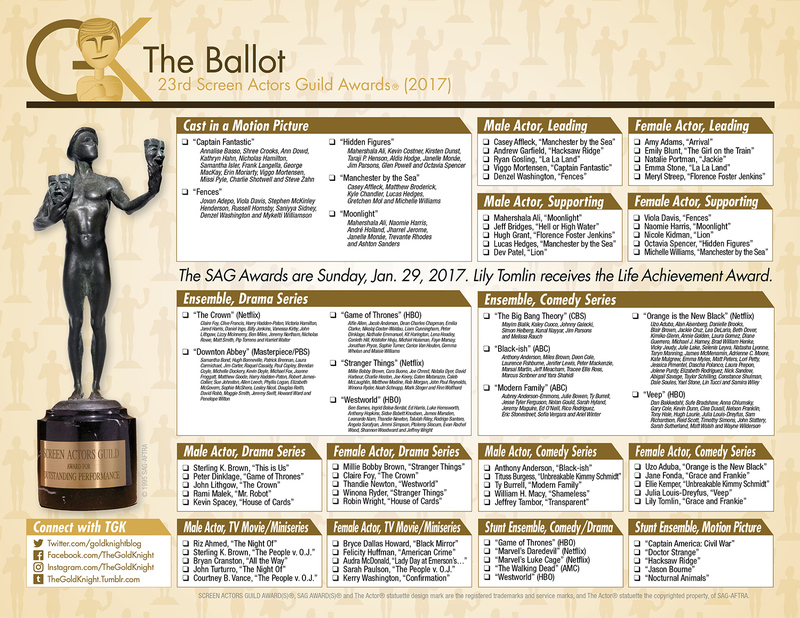 Awards season is in full swing and next up: the 23rd Screen Actors Guild (SAG) Awards on Sunday night. 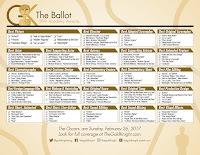 To get ready for the big night, download and print out this ballot and pass out at your workplace or during your party (go here to download the PDF). It's in glorious color. 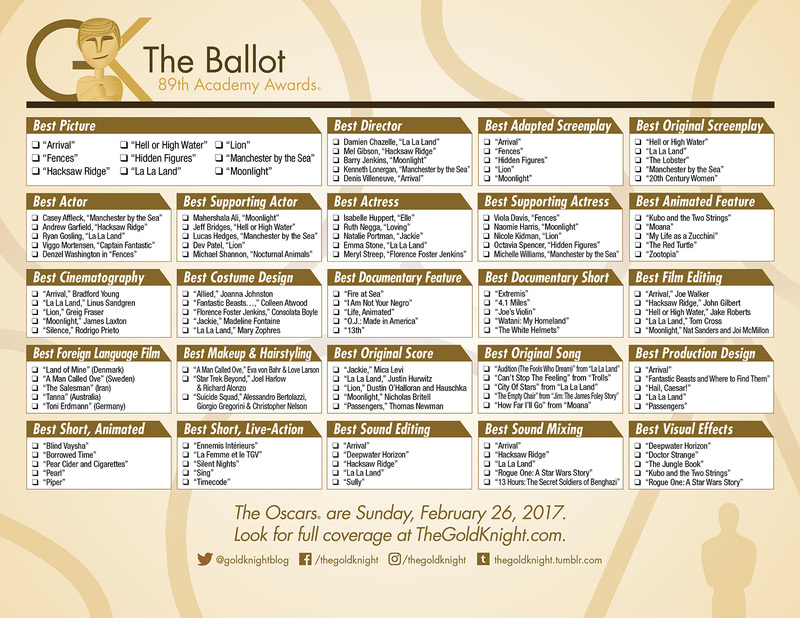 “Manchester by the Sea” is the most nominated movie with four. The top TV shows, each with three nominations, are “The Crown,” “Game of Thrones,” “The People v. O.J. Simpson: American Crime Story,” “Stranger Things” and “Westworld.” Netflix was the top network with 17 nominations. We'll find out on Sunday night which actors and ensembles will take the top prizes. The 23rd Screen Actors Guild Awards will be simulcast live on TNT and TBS on Sunday, Jan. 29, 2017 at 8 p.m. ET / 5 p.m. PT. TBS and TNT subscribers will also be able to watch the SAG Awards live through the networks' websites and mobile apps. 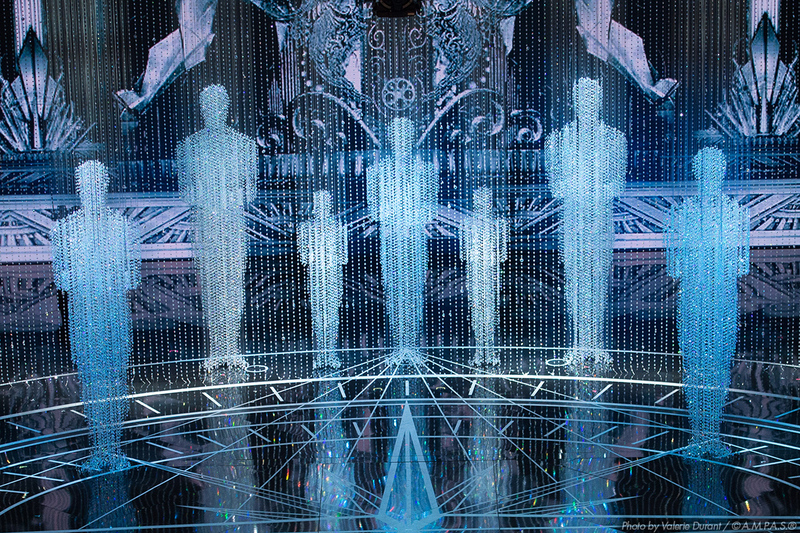 In addition, TNT will present a primetime encore of the ceremony immediately following the live presentation. Prior to the televised ceremony, the stunt ensemble honorees will be announced from the red carpet during the SAG Awards Red Carpet Pre-Show, which will be webcast live on sagawards.tntdrama.com, sagawards.org and People.com beginning at 6 p.m. ET / 3 p.m. PT.